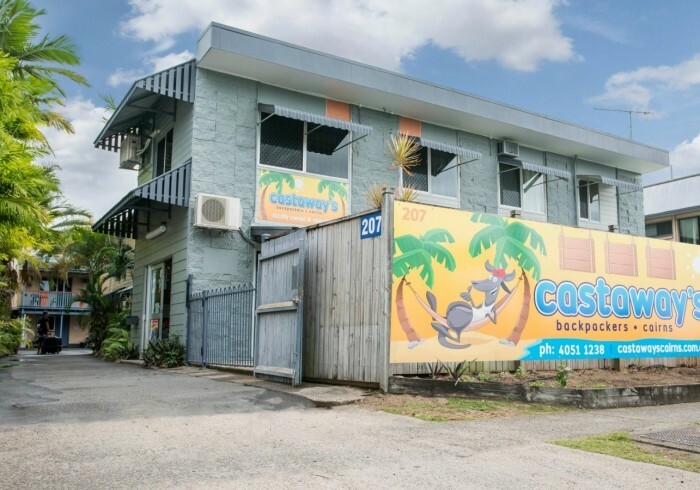 Castaway's Backpackers is a small, clean, family-owned hostel that has been operating in Cairns for 26 years. We have friendly staff providing travelers with a real "home away from home" atmosphere.Our staff have expert knowledge of all the local tours and are happy to help you book trips to make your stay a memorable one.We provide our guests with FREE wifi, FREE tea and coffee, discounted meal vouchers and a weekly BBQ.Our place has a lovely, tropical swimming pool, fully equipped kitchen, a TV lounge with FREE movies and a book exchange.Castaways Backpackers has been awarded the Certificate of Excellence 2015 for the fifth year in a row by Tripadvisor and the 2014 Top Choice Award by Lianorg.com.We provide a FREE bus shuttle to and from the city centre. Castaway's Backpackers is located near Cairns Airport.We also have private ensuite rooms available. We have NO bunk beds, real beds only! Important information: Please let Castaways Backpackers Cairns know your expected arrival time in advance. You can use the Special Requests box when booking, or contact the property using the contact details found on the booking confirmation.